Artisan Water Mixable Oil Color has been specifically developed to appear and work just like conventional oil color. The key difference between Artisan and conventional oils is its ability to thin and clean up with water. 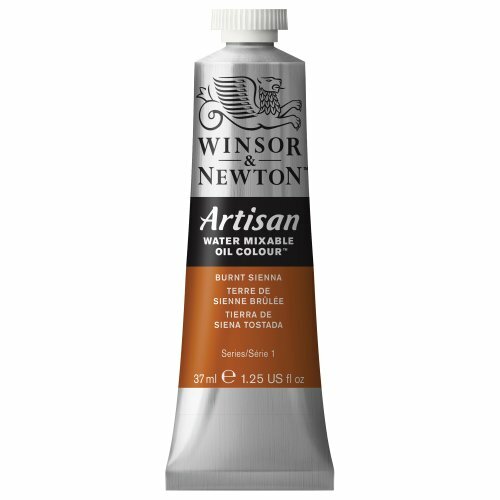 Hazardous solvents are not necessary for Artisan and artists can enjoy a safer painting environment, making it ideal for artists who share a work space, schools or painting at home. Like traditional oil color, Artisan Water Mixable Oil Color is made from linseed oil and safflower oil but the difference is the linseed oil and safflower oil used in Artisan have been modified so that they will mix and clean up with water. Burnt Sienna is a rich brown pigment made by burning Raw Sienna. Named after Siena in Italy, where the pigment was sourced during the Renaissance, it is a transparent pigment with red-brown tones. 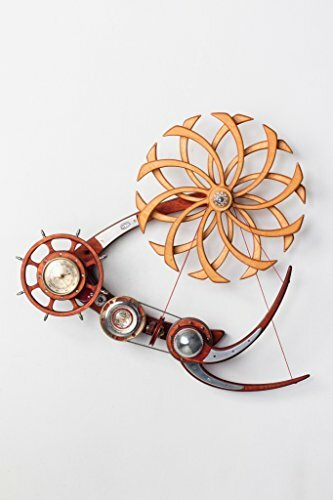 This entry was posted on August 30, 2018, in Sculptures. – Painted by natural plant lacquer, which is produced by trees mostly, healthy and safe. – Carefully manual polishing by highly skilled workers, Each one is really work of art. – Classic design and strong material makes it durable. – Perfect smooth surface and color makes it one in a million that you can not miss. 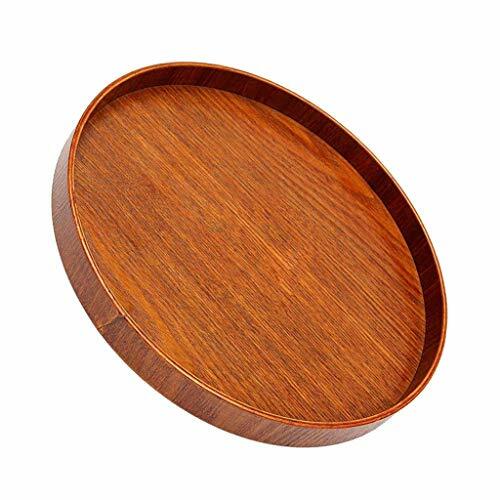 – Multi-functional, good for holding food, fruits, coffee, tea, etc. Please feel free to contact us if you have any questions, And enjoy your shopping! Painted by natural plant lacquer, which is produced by trees mostly, healthy and safe. Carefully manual polishing by highly skilled workers, Each one is really work of art. Classic design and strong material makes it durable. Perfect smooth surface and color makes it one in a million that you can not miss. This entry was posted on August 30, 2018, in Prints. Founded in 1939, Duralex has been manufacturing tempered glassware and tabletop products for over 80 years in La Chapelle-Saint-Mesmin in the very heart of France. Since 1939, when Duralex invented the glass tempering process, the name Duralex has been associated with toughened glassware, utilizing their proprietary process. Duralex is and will always remain a true French manufacturer of glassware and tabletop products, and is the only glass manufacturer that makes 100% of their products in France. Named after the Lys River which traverses through France and Belgium, the Lys Square Bowl by Duralex, is symbolic of what this wonderful tributary used to represent to some of France’s most famed artists: clarity, simplicity, utility, and of course, beauty. 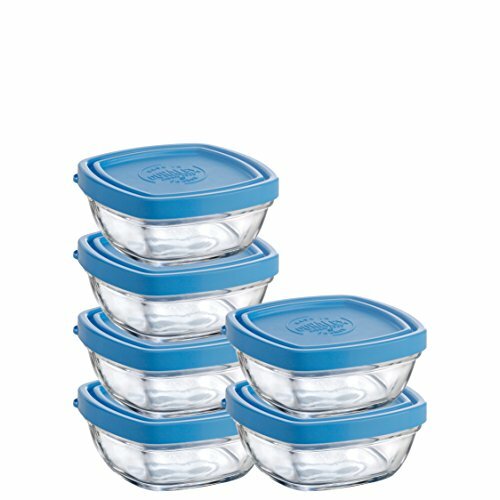 It is clear, stackable, and safe for dishwasher, freezer and microwave. Because it is both hot and cold resistant, it can go straight from the freezer to the microwave. Extremely durable, tempered glass – impact and chip resistant. Made in France. This entry was posted on August 30, 2018, in Glass. We mainly sell fashion jewelry and accessories, such as necklace, earrings, ring, bracelet, anklet and so on, we’re glad to show you more trendy jewelry and maybe other products in future. Your order will be fulfilled by Amazon from US, its fast and safe. If there is any problem with your order, please feel free to contact amazon service center or e-mail us at first, will help you to figure out it, no worry; no hurry if we can’t reply you in time, thanks for your understand! 1, other seller may be competitor and it sells our items viciously, so price maybe cheaper and quality is bad. 2, how many days need you to wait? items from other sellers maybe not shipped from US, so you need to wait 10-30 days. 3, maybe the price from other seller is cheaper, but will charge you much courier fee. 60-Day Money Back or Product Exchange Guarantee. We’ll try to give you best customer service and appreciate your positive feedback! 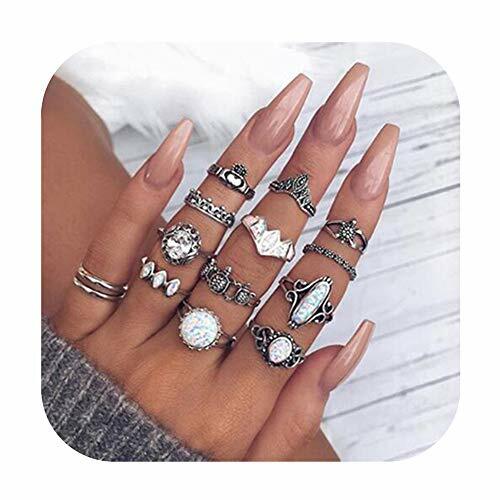 12pcs vintage simulated gemstone knuckle rings in one order. This set combined with various style rings,including white opal ring,crystal round ring ,cute turtle ring,simple heart claddagh ring,crown ring,oval rope edge vintage band ring etc. Please be certain the size before buying,vintage carve pattern design with different size from 3-7 . This retro stakable ring set allows you to better attract people’s attention at various parties and daily meeting. We can provie 60-day money back or product exchange guarantee.One by one check, we wanna provide you a pretty shopping experience. You can roll out the welcome mat with these adorable birds who’d love to pose in home or garden. 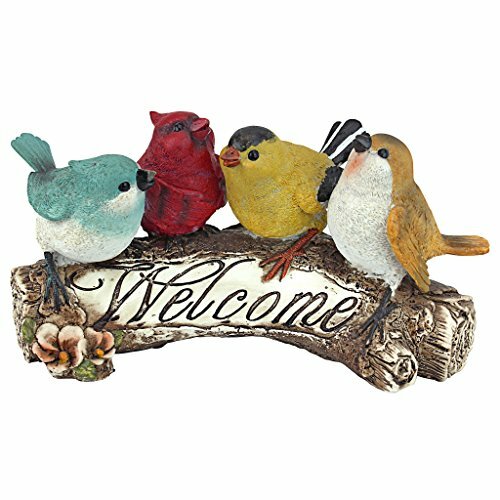 Our Design Toscano-exclusive, bird welcome statue, complete with four adorable birds, is sculpted 360 degrees for an even “chirpier” welcome! Cast in quality designer resin, this bird welcome sculpture is hand-painted as the perfect house-warming gift with a little bit of garden hospitality! Another Design Toscano-exclusive garden animal statue! 4 ½”Wx10 ½”Dx5″H. 2 lbs. This little life sized (Loggerhead) turtle has just broken out of its shell and is about to climb out. The shell is weighted, so it will not roll over. If tilted it always rolls back upright. We have named it TIPSY TURTLE. It is difficult to show the movement in still pictures, but be assured, it is very entertaining and most people enjoy it a lot! 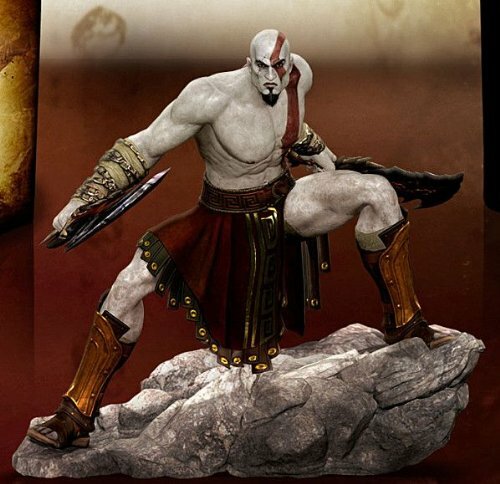 It is meticulously sculpted in great detail and cast in a durable polyurethane resin and hand painted. It stands about two inches high and 21/2 inches wide. The egg is about the size of a chicken’s egg. It comes with a CERTIFICATE OF AUTHENTICITY. 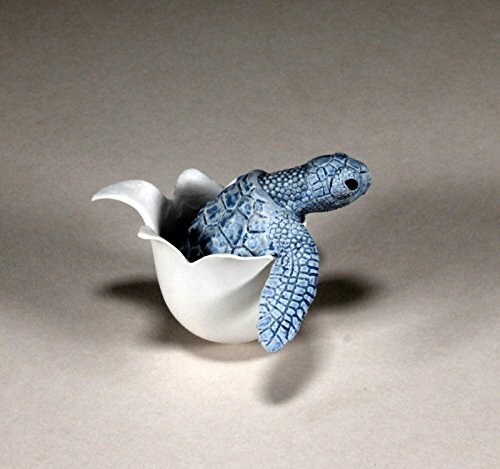 See the green version of the same Tipsy Turtle, its companion piece Turtle Hatchling and other of John’s sculpture in our Amazon store. We usually ship very quickly, sometimes even the same day if the order comes in early, otherwise it is nearly always the next day, the exceptions being Mondays when, because of the number of orders coming in from the weekend, some orders may not get shipped until Tuesday. This entry was posted on August 30, 2018, in Art. 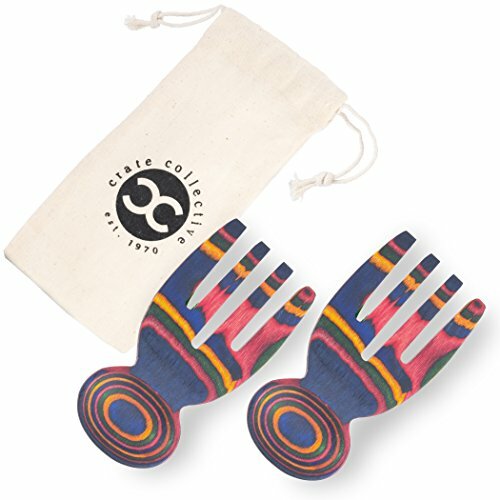 Our Crate Collective Salad Hands are the perfect tool for tossing and serving salads in your kitchen. We have crafted these amazing Salad Hands for special occasions, and their lightweight yet solid feel makes them great for everyday use. The smooth concave handles are designed to conform to the palm, bringing you comfort as you perfect your salad-making skills. The long tongs delve deep into your salad bowl, reaching all the way to the bottom for quick and enjoyable salad tossing. What’s more, our premium pakkawood material is stain resistant and easy to clean, so there’s nothing stopping you from achieving success in your kitchen.